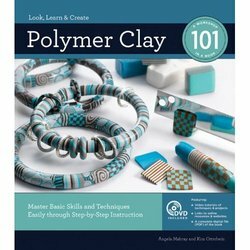 Polymer Clay 101 is filled with thorough instructions and step-by-step photographs that expertly guide readers through the basics of crafting with polymer clay. Authors Angela Mabray (Crafty Goat herself!) and Kim Otterbein teach you about the tools and techniques used for this craft. Each of the 20 projects in the book introduces a new way to get creative with polymer clay. As you explore this all-inclusive workshop, you will gain confidence in your skills and be encouraged to design your own projects. Make jewelry, tool handles, knick-knacks, or ATCs. The book's hidden spiral binding means you can leave it open on your craft space while you work on a project. The included DVD demonstrates each of the book's techniques. Great for visual learners who want to watch polymer clay crafting in action! For more information on the book — including a preview of the DVD — visit the Polymer Clay 101 website. Cost is $20, payable by Paypal. Shipping via USPS Media Mail is included in this special price. U.S. addresses only. Want Angela to sign your copy? Please specify in your order comments if you want the book signing personalized in a specific way.